The first President of the Republic of Indonesia, Soekarno, who used to be called Bung Karno, was born in Blitar, East Java, June 6, 1901 and died in Jakarta, June 21, 1970. His father named Raden Soekemi Sosrodihardjo and his mother Ida Ayu Nyoman Rai. During his life, he has three wives and had eight children. Fatmawati wife have children from Guntur, Megawati, Rachmawati, Sukmawati and thunder. Hartini wife has Taufan and Bayu, while the wife Ratna Sari Dewi, whose real name is woman derivative Japan Naoko Nemoto Kartika have children ..
Soekarno's childhood just a few years living with her parents in Blitar. During the elementary to graduate, he lives in Surabaya, lodger in the house Haji Said Oemar Tokroaminoto, veteran politician Syarikat founder of Islam. Then continue their education at HBS (Hoogere Burger School). 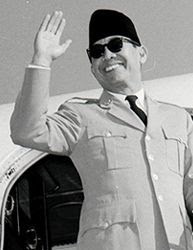 While studying at HBS, Sukarno had galvanize nationalist spirit. After graduating HBS in 1920, moved to London and continue to THS (Technische Hoogeschool or Higher Engineering School which is now the ITB). He won the title of "Ir" on May 25, 1926. Then, he formulated and established the doctrine Marhaenism PNI (Nationalist Party lndonesia) on July 4, 1927, with the goal of an independent Indonesia. As a result, the Netherlands, put him in jail Sukamiskin, New York on December 29, 1929. Eight months later a new trial. In his defense, entitled Indonesia Sues, he showed apostasy Netherlands, a nation that claims it is more advanced. Defense that made the Dutch more upset. So that in July 1930, PNI was dissolved. After his release in 1931, Sukarno joined Partindo and well led. As a result, he was re-arrested by the Dutch and exiled to Ende, Flores, 1933. Four years later moved to Bengkulu. After a long struggle, Bung Karno and Bung Hatta proclaimed Indonesia's independence on August 17, 1945. In the trial BPUPKI dated June 1, 1945, Ir.Soekarno present ideas about the basic state called Pancasila. Dated August 17, 1945, Ir Soekarno and Drs. Mohammad Hatta proclaimed Indonesia's independence. In the trial PPKI, August 18, 1945 Ir.Soekarno elected by acclamation as the first President of the Republic of Indonesia. Previously, he also managed to formulate Pancasila which later became the basis (ideology) of the Unitary Republic of Indonesia. He seeks to unite the archipelago. Even Sukarno tried to gather the nations of Asia, Africa, and Latin America to Asia-Africa Conference in Bandung in 1955 which later evolved into the Non-Aligned Movement. G-30-S/PKI rebellion gave birth to a great political crisis that led to rejection of the Assembly on accountability. Instead MPR raised Soeharto as Acting President. His health continued to deteriorate, which on Sunday, June 21, 1970 he died in the army hospital. He was interred in the House Yaso, Jakarta, and was buried in Blitar, East Java near the tomb of his mother, Ida Ayu Nyoman Rai. Confer the government as a "Hero of the Proclamation". Jakarta, Tuesday, June 16, 1970. Intensive care room filled with soldiers Gatot Subroto Army Hospital since morning. Uniformed soldiers and armed full alert at several strategic points of the hospital. Do not lose much, plainclothes security officers also paced the hospital corridor to the parking lot. From the early, eerie atmosphere is felt. The news that blow saying, former President Sukarno will be brought to this hospital from home detention in the House Yaso which is only five kilometers. Tonight, the rumors are proved. In the treatment room is very simple to the size of a former president, Sukarno lying weak in bed. Already some of today's health is very backward. Throughout the day, people who once was so powerful it kept closing his eyes. Very high body temperature. Kidney disease is not treated properly increasingly undermined the strength of his body. The man who had a very manly and dignified, and therefore many digila-gilai women all over the world, it was like to live like a corpse. No more handsome face. Now the face is decorated gingsulnya tooth has swollen, a sign that the poison had spread everywhere. Not only swollen, but the hollow-hollow like the moon's surface. Mouth that used to be able to enchant millions of the masses with his speeches are very intriguing, is now pressed together and dried. Intermittent trembling lips. In pain. His hands that used to be able to punch the sky and clawed the air, now lying limp at his sides are increasingly thin. Two days later, Megawati, the eldest son of Fatmawati allowed the army to visit his father. Watching his father, who lay weak and unable to open his eyes, his eyes shed tears Mega. His lips slowly brought closer to the human ear is most beloved. "Sir, sir, it Ega ..."
His father did not move. His eyes did not open. However, Sukarno, who has two lips chapped little twitching, trembling, as if to say something on that his eldest daughter. Megawati Soekarno's presence seemed to know. But he was unable to open his eyes. His right hand trembled as if he wanted to write something for his eldest daughter, but her body was too weak to simply write. His hands were limp again. Soekarno was silent again. Looking at the fact that Megawati feeling very upset. Tears who had been detained now drip down. Increasingly heavy. The young woman covering her nose with a handkerchief. Unable to accept the fact, Megawati away and bewildered. Mega was carried out immediately. Continues to move clockwise. Outside the room, an army soldier keeps vigil complete with weapons. In the evening the body of a Sukarno resistance to collapse. He coma. Between life and death. Team doctor immediately provide the necessary assistance. The next day, the former vice president Mohammad Hatta was allowed to visit his old colleagues. Hatta, who was accompanied by his secretary went to bed Soekarno with extreme caution. With all the forces that successfully dihimpunnya, Sukarno managed to open his eyes. Withstand unspeakable pain, Sukarno said weakly. "Hatta .., you're here ..?" Which is addressed can not hide her sadness. But Hatta did not want to know if her friend is sad. With a vengeance harbored pain that tore the heart, tried to answer the Soekarno Hatta properly. Smiled a little entertaining. "Yes, how are you, No?" Hatta greeted him as he used in the past. Sukarno's hand gently holding her hand. The heat coursed through her fingers. He wants to give power to people who really respect this. Sukarno's lips trembled, suddenly, still weak, she asked the Dutch language. Something they normally did when they were both united in Duumvirate. "Hoe gaat het met jou ...?" How are you? Hatta forced a smile. Sukarno's hand was still holding the arm. Sukarno then sobbed like a child. Mighty man was crying in front of fellow compatriots, who have lost babies like toys. Hatta is no longer able to control his feelings. Defenses collapse. Tears spilled as well. Hatta began to cry. These two old friends who had parted it, holding hands as if afraid to separate. Hatta know, the time available for those who admired this will not be long. And Hatta also know how cruel torment suffered a blow this friend. Something that can only be done by a man who has no conscience. "No ..." That's all I can come out of her mouth. Hatta is not able to say more. His lips quivered at the same time hold sadness disappointment. His shoulders shook. Deep down, Hatta was very angry at the new ruler of the heart to punish the father of this nation. Although the political principle between himself and Sukarno did not correspond, but it did not ruin persabatannya so close and sincere. Soekarno Hatta is still holding the arm when his friend closed his eyes again. Continues to move clockwise. Creeping figures for the numbers. Remaining time for Sukarno increasingly thin. A day after meeting with Hatta, Sukarno's already bad conditions, continued to decline. Son of the Dawn was unable to open his eyes. Body temperature continues to rise. Soekarno was shivering now. Sweat soaked pillow and pajamas. At night Dewi Sukarno and his daughter who was three years old, Karina, was present at the hospital. Sukarno had never seen his son. Sunday morning, June 21, 1970. Mardjono physician, a member of the presidential medical team as usual did a routine check. With two paramedics, doctors Mardjono check this special patient conditions. As a physician who has experienced, Mardjono know the time is not long to live. With great care and reverence, he checked the pulse of Sukarno. With the remaining forces are still there, Soekarno moved his right hand, holding the arm of her physician. Mardjono feel the heat as high of a very weak hand. Suddenly the heat is limp hand. Sukarno was also second last breath. His eyes were never again able to open. His body lay motionless. Now for good. The situation around the room very quiet. Instantaneous air flow was stopped. The usual sounds of birds chirping no sound. Void fraction of a second is so gripping. And sad. - Removing one of the world's history makers of controversy. Many people loved him, but many of them hate it. But all agreed, Sukarno was an unusual man. Are not necessarily born into a century. Man is now gone. Mardjono doctor immediately called all his colleagues, fellow presidential medical team. Soon, they issued an official statement: Soekarno had died.